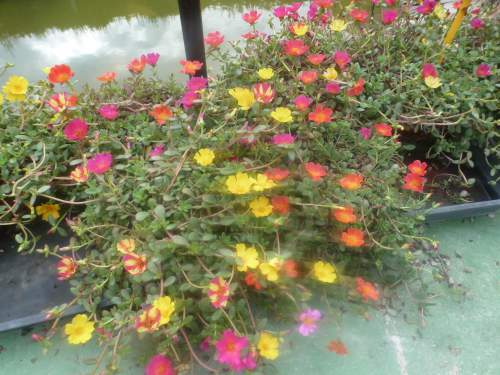 Verdolaga is a succulent with the botanical name of Portulaca oleracea. 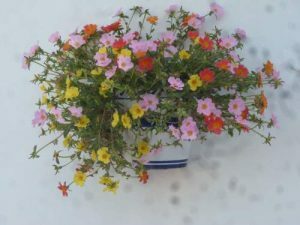 Grown in Spain it is possible the easiest and most prolific flower to grow on the patio or out in the garden. They just love growing and sprawling in pots and hanging baskets, if in a bed the succulent stems and leaves creep along the ground and bloom in bright coloured satiny crinkled flowers all summer, with Verdolaga blooms opening only in full sun. The flowers come in all shades of pink, red, yellow and orange. 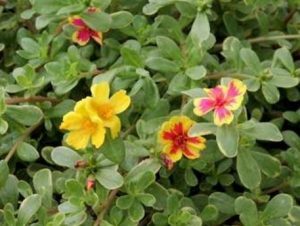 Purslane is a colorful drought and heat tolerant flowering plant for the landscape that works well in hanging baskets too. Collecting seeds from purslane. Harvesting is fine after the pods have burst, you just get less seeds because of them will have fallen out. The seeds should store easily for many years, but make sure you keep them dry. I allways use paper bags not plastic to save them in Apart from the wonderful display of flowers all summer, purslane is a great salad plant, and contains more omega 3 fatty acid than any other plant. It is an excellent source of Vitamin A (100 g provides 44% of RDA). Purslane is also a rich source of vitamin C, and some B-complex vitamins like riboflavin, niacin, pyridoxine and carotenoids, as well as dietary minerals, such as iron, magnesium, calcium, potassium, and manganese. Although purslane is considered a weed in the United States, it is often used in countries like Spain as a leaf vegetable. It has a slightly sour and salty taste and is eaten throughout much of Europe, the middle east, Asia, and Mexico.The stems, leaves and flower buds are all edible. Purslane may be used fresh as a salad, stir-fried, or cooked as spinach is, and because of its mucilaginous quality it also is suitable for soups and stews. 1g (approx. 2500) purslane seeds PORTULACA OLERACEA five times richer in omega-3 fatty acids than spinach, Extremely high level of vitamins. The stems, leaves and flower buds are all edible. Purslane can be used fresh as a salad, stir-fried, or cooked like spinach, and because of its mucilaginous quality it is also suitable for soups and stews!!! Purslane herb is five times richer in omega-3 fatty acids than spinach, and is high in vitamin C also. Common Purslane, also known as Verdolaga, Pigweed, Little Hogweed, or Pusley. Botanical name: Portulaca oleracea L.
Spain info covers local towns with local accommodation, plus Spain info also covers info local days out in Spain on the Mediterranean. Spain info with information on gardening in Spain Mediterranean style. Furthermore we offer information on cooking Mediterranean style. In addition Spain info also covers Bowls Clubs Golf Go Karting fishing Caves and other sports here in the Mediterranean. Finally Spain info also lists the Local Hot Water Spas many of them dating back to Roman times. Spain Info, Verdolaga, San Francisco De Asis, Urb La Marina, San Fulgencio, 03177, Alicante, Spain.